A norovirus outbreak at Dublin Elementary School has raised the alarm for parents and county health officials, according to the Alameda County Public Health Department. 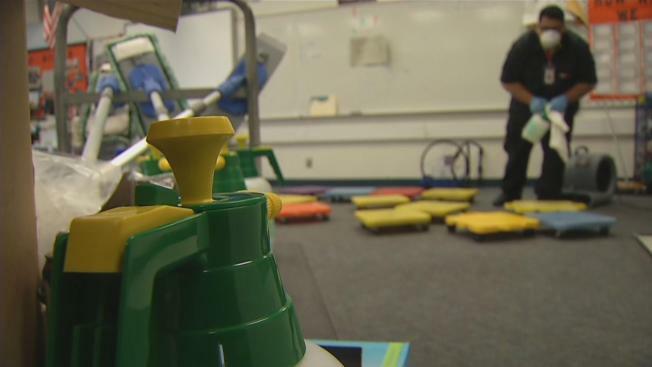 At least 32 students and staff from the elementary school have reported suffering from norovirus symptoms, and one child has reportedly tested positive for the illness, Alameda County Public Health Department spokesperson Sherri Willis said in a statement. The school since Friday has been in contact with the health department in an attempt to halt a potential spread. Cleaning crews have been working around the clock to stop the severe stomach bug from spreading. "We are cleaning computer keyboards and playground balls," Dublin Unified School District spokesperson Michelle McDonald said. "(Anything) that's a touch point on this campus is being thoroughly cleaned." Health officials said so far the outbreak has been contained to the elementary school. Parents, especially with multiple kids, hope it stays that way. "We just don't want it to spread to the rest of the kids," parent Rebecca Smith said. School officials sent a letter to parents warning them about the outbreak and the necessary steps that need to be accomplished in the event that a child falls ill.
Any child exhibiting norovirus symptoms, which include vomiting, diarrhea, abdominal cramps, pain, low fever, headache and muscle aches, is instructed to seek medical attention and completely recover for at least two days before returning to the classroom or any other public event, such as birthday parties, sporting events or other social gatherings. In order to prevent catching the bug, youngsters are encouraged to wash their hands thoroughly with warm water for several seconds after visiting the restroom and especially before eating. For more information regarding norovirus, visit the CDC website.